THE opposition UPND leadership has been challenged to go to the Southern province and see the sufferings of the people that were displaced by their supporters instead of concentrating on petitions, Kabushi Member of Parliament Bowman Lusambo has charged. Mr Lusambo said the opposition UPND had failed to come out in the open to condemn the spate of violence that characterised in some parts of the country, especially in Southern province. He said politicians should put the interests of the people first and not their interest as such would only expose their selfishness. Mr Lusambo stated that none of the opposition UPND had taken interest in visiting those displaced citizens by their supporters in Southern province where they had been given a mandate to represent them in Parliament. “Not even one MP in Southern province has taken interest in the happenings in the province where they are given chance to represent the people because they have got no heart for the people. They have their own personal interest and not that of the people,” he said. Mr Lusambo said the PF would continue to ensure a united Zambia, saying it was for that reason they had taken time to visit those displaced families because they (MPs) represented the Government for the people. He challenged UPND to go back to the people and stop concentrating only on issues that were based on fulfilling their heart’s desires at the expense of safeguarding the welfare of the Zambian people. 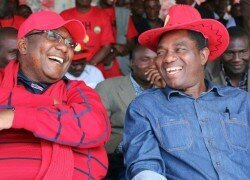 He said it was the same UPND that seriously criticised the Constitution making process and yet, they appeared to be the ones that were now benefiting from it. “UPND has no vision for this country. What they want is to serve their personal interest. Instead, Mr Hichilema and Mr Mwamba must go to the Southern province and see how the people are suffering, and they must come out in the open and genuinely condemn in strongest terms the barbaric behaviour of their violent supporters,” Mr Lusambo said. He said the UPND should realise that Zambia must come first and was bigger than any other political party and therefore, the interests of the people should be a priority.